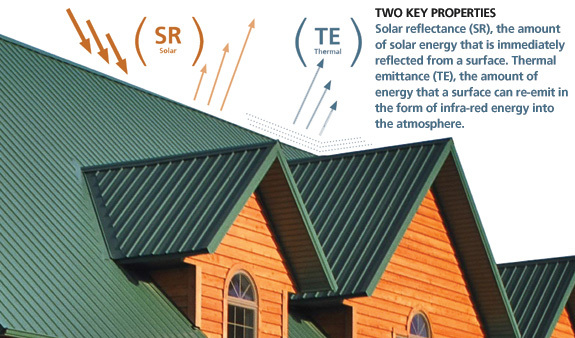 Metal Roofing resists Mother Nature's abuse with sound science. Function often supersedes aesthetic appeal when working on practical constructions like roofs for barns and commercial facilities. Where residential homes are concerned, many homeowners default to traditional asphalt shingles, believing them to be more practical and cost effective than metal. Not so. In fact, metal prices are competitive and the benefits a metal roof provides are worth considering. “We’ve been selling metal roofing for 70 years and in that time metal roofing has been through many transitions,” says Chris Allis, manager of CC Allis & Sons Inc., a full-service lumber, hardware and building materials supplier in Wyalusing, Pennsylvania. 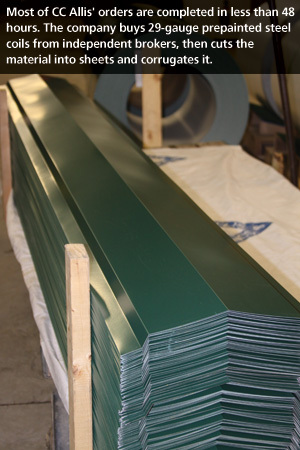 The company’s metal roofing capabilities embody the latest in coated coil technology using Valspar WeatherXL. The real upswing in metal roofing demand has occurred in the last 10 to 15 years. “It used to be for just rural applications, barns, pole barns and agricultural facilities,” Allis recalls. “We still see the demand in those areas but we’re also seeing people using metal roofing for their garages and now, their homes. “The value is that the metal is no longer the high-priced item that it once was,” he continues, adding that it is easy to repaint the metal roofing if a different color is desired, or it can be scrapped altogether, allowing an owner to redeem some of the investment, which is not the case with traditional asphalt shingles. CC Allis ramped up its effort to stay competitive in the roofing business by adding in-house roll forming capabilities. A one-stop shop, the company has its own roof truss manufacturing and design service to aid those wanting to build garages or pole barns. “We can quote estimates and give drawings as well as transport everything using our own trucks with forklifts. We can bring materials directly to a customer’s job site,” Allis says. Before CC Allis acquired its own transport equipment for roofing systems, material was often handled by hand, risking scuffing and scratches. Users want to avoid scratching coated surfaces because that’s where moisture gets in to corrode the substrate. Most orders are completed in less than 48 hours. Instead of five days lead time due to outsourced roll forming, the company can also now accept last-minute orders and turn them around rapidly. “We can do trim in 10 minutes if needed,” Allis says. The company buys 29-gauge prepainted steel coils from independent brokers, then cuts the material into sheets and corrugates it. “The broker we worked with had a couple of coating options and Valspar’s vibrant paint pigments stood out,” says Allis, adding that after he expressed interest in the brand, a Valspar representative unexpectedly showed up to his shop to answer any questions and explain the science behind the coating’s durability. “We’ve handled metal roofing from different suppliers for decades and this is the first time in 70 years we had the actual paint rep come see us—that stood out,” he says. Valspar doesn’t modify products overnight but that’s a good thing. Over the span of a decade, the company has time tested its latest coatings. For example, it exposed samples of WeatherXL to natural elements to conduct resin and pigment tests on its silicon-modified polyester system. WeatherXL is an innovation shaped from its predecessor, WeatherX. “When we develop products, it’s a multiyear process and each product builds on work done during a five- to seven-year span,” says Channing Beaudry, technical manager at Valspar. Long-term testing is no joke: Valspar has some panels out in the field that are more than 50 years old. This is how Valspar obtains its most reliable data. “Like our competitors, we run accelerated testing as well," notes Beaudry. Accelerated testing subjects coated material to 500 to 1,000 hours under QUVA light bulbs, much like those used in tanning beds. This process produces faster results, but samples are tested in a cabinet using artificial light. In other words, while accelerated, it's not real life. “It’s a good way to screen and get some testing [data] but it isn’t 100 percent telling you what would happen in the real world; it’s about 70 percent telling,” Allis says. Using natural exposure tests, researchers can go to specific screenings at various locations, many of which are near Fort Myers, Florida, chosen for an extreme amount of annual sunlight, “the biggest culprit for fading compared to other elements of nature,” Allis explains. Retaining color isn’t the only concern consumers have. These coatings endure wear and tear from the roll forming process to inventory and shipment/delivery. Formability is important and the trick is to modify the formulation to get good bending and maximize scratch resistance. Valspar has relationships with multiple universities in North Dakota, Minnesota, Kentucky and Florida that explore its formulas. With the help of various equipment made available by the universities, Valspar is able to test corrosion and paint film properties under a wide range of conditions. As it develops new formulas, the paint is tested through both coil coaters and roll formers, which shape the panels that are finally stacked and shipped to job sites. “The potential to scratch is a major concern so we worked to minimize scratching damage through handling. That was a lot of work,” Beaudry says. CC Allis seeks strength, durability and flawless surfaces in its prepainted coils because when there are scratches, “that’s when the steel underneath starts to rust and you run the chance of a panel breaking down,” Allis says.